Fancy a colourful casual Thai catch up? Dietary Information: Vegetarian, vegan, gluten-free and dairy-free options available. Halal meat also served. 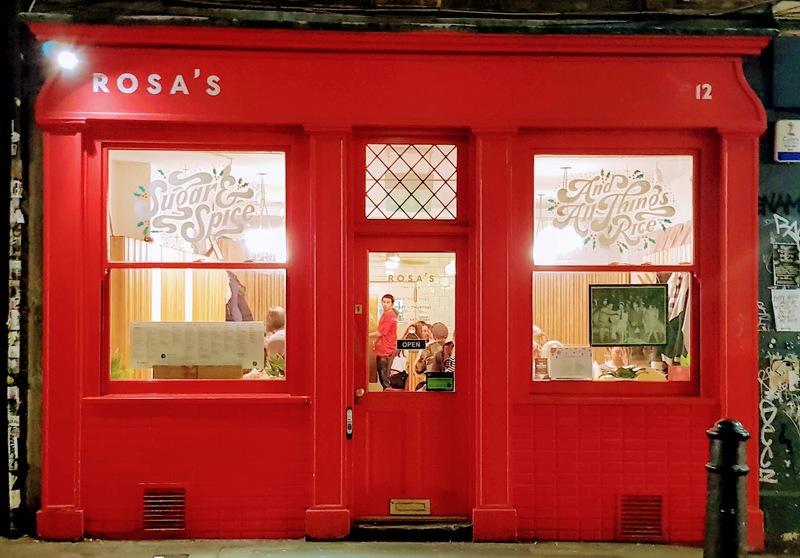 Key Tip: Rosa's Thai Cafė doesn't take bookings unless it's for large groups and the place is always packed weekdays and weekends. I haven't had to wait long so far, but it's a possibility, so it's worth bearing in mind. Rosa's Thai is a popular chain of restaurants with several locations. I've been meaning to try it for some time but it always slips off the radar because, if I am honest, I was dubious about how good such a popular commercial chain could be. 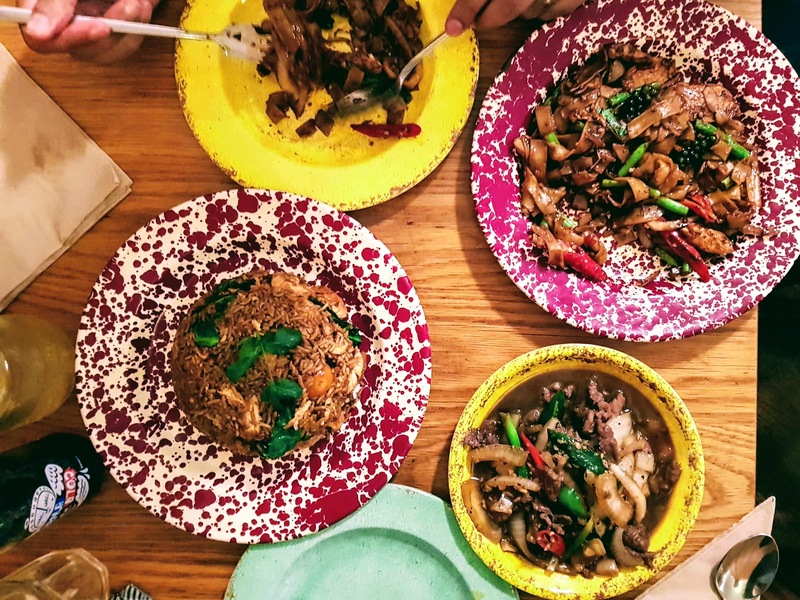 However, it's actually quite a good spot if you are looking for some casual, affordable Thai food with all the usual favourites on offer. 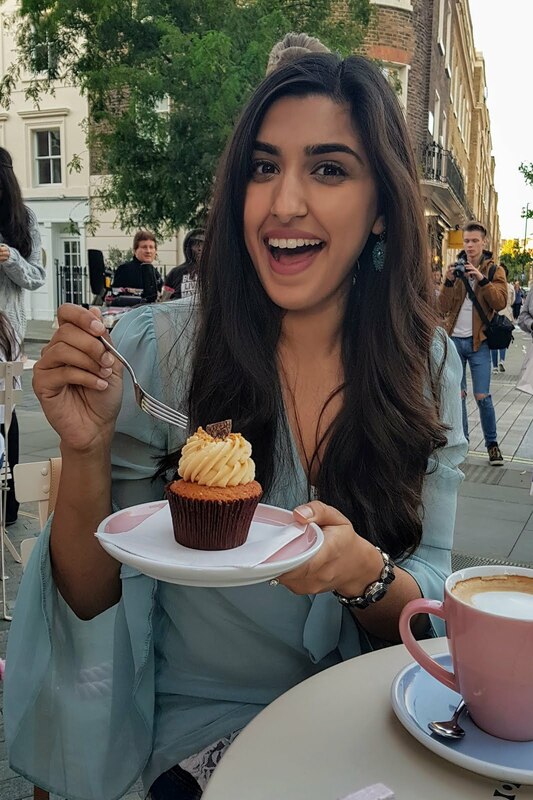 While the interiors are nothing special and the restaurant has definitely tried to utilise as much space as possible, making some tables a bit cramped, the food can be good depending on what you order (see more below). 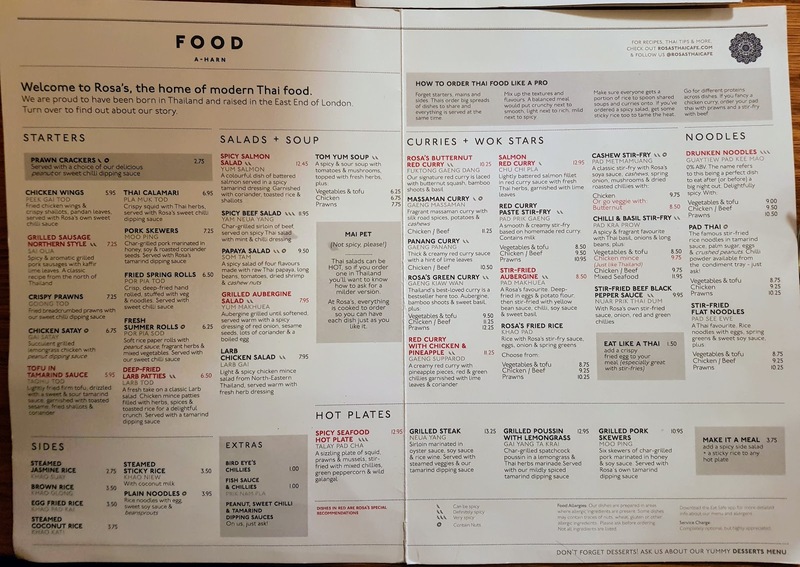 The menu has a wide variety of dishes and the spice level is all clearly marked which I massively appreciated as I really can't handle spicy food. Having said that, even the maximum spice level is fairly mild. However, they have extra chilli sauce/oil available if you do like a little more kick to your food. 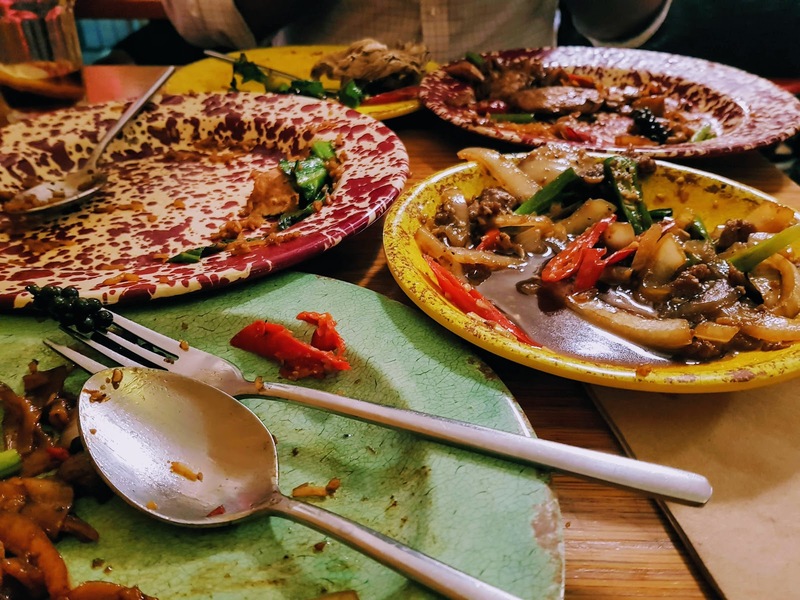 The restaurant also has specialist vegetarian, vegan and gluten-free menus available all of which you can have a look at online before you head out. I definitely doubt the authenticity of Rosa's Thai's food with a lot of the dishes having been adapted to western taste. That doesn't make it bad, it just means if you are looking for a cultural experience, this is most likely not it. The food is hearty, warming and definitely comforting. It's also extremely filling but also heavy and portions are large. 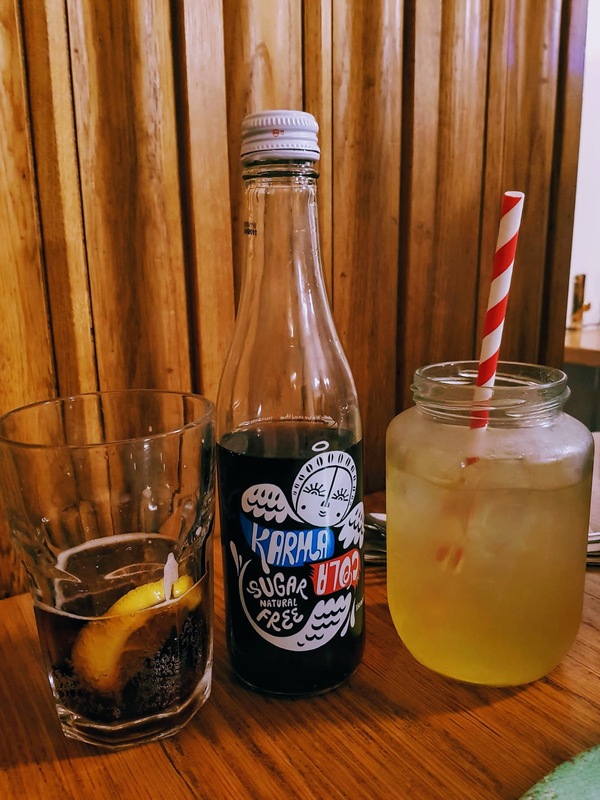 The restaurant has a good selection of drinks available and my favourite has to be the karma cola which is not sweet like regular coke and has a distinct taste which I can't quite explain. You just have to try it. There is also a range of fusion lemonades on offer which is delicious but sweet rather than zingy (I personally like a little zing). For starters, I tried the Crispy Prawns which were really good. 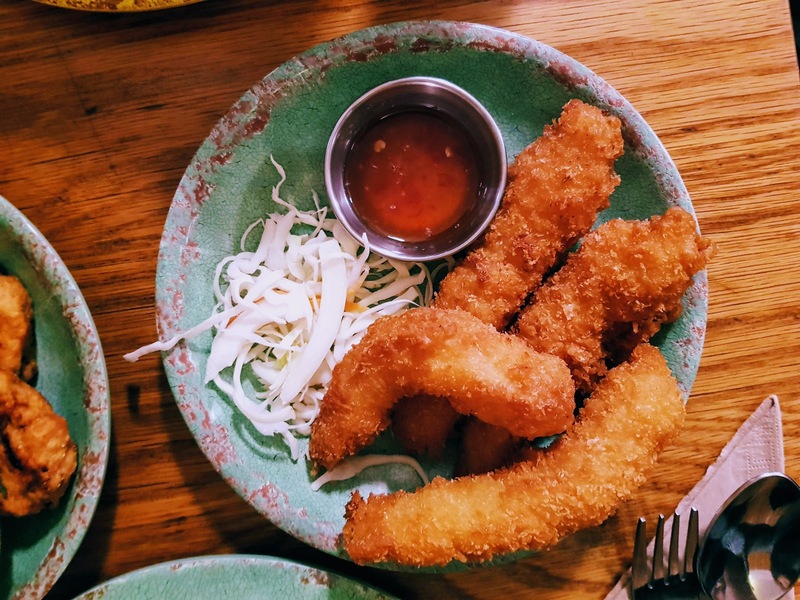 The prawns are absolutely huge, the batter wasn't too thick or bready and they were as you would want them to be, crispy, hot and served with sweet chilli sauce. The Fresh Summer Rolls, on the other hand, were not for me. 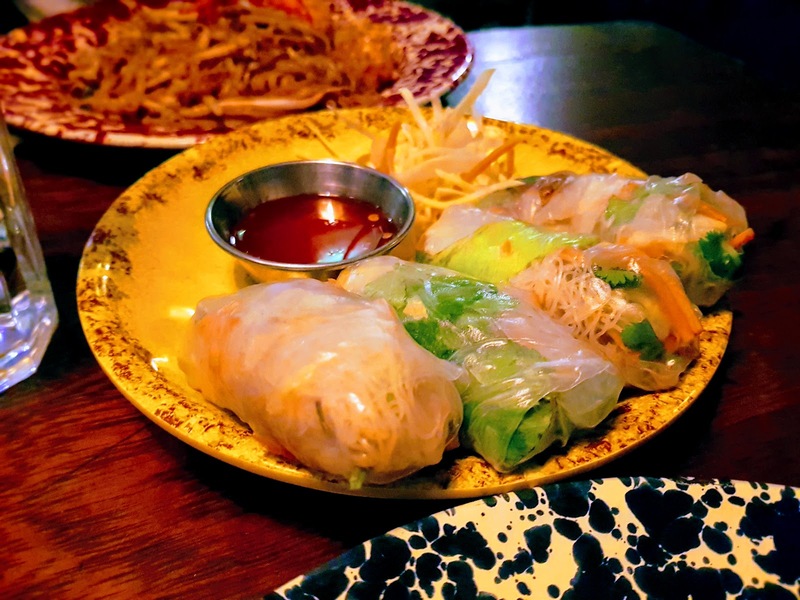 These rolls are made with rice paper, which has a plastic like consistency, and are effectively salad rolls. As such, despite often featuring as a Thai starter, I don't think they work well as a dish by themselves. 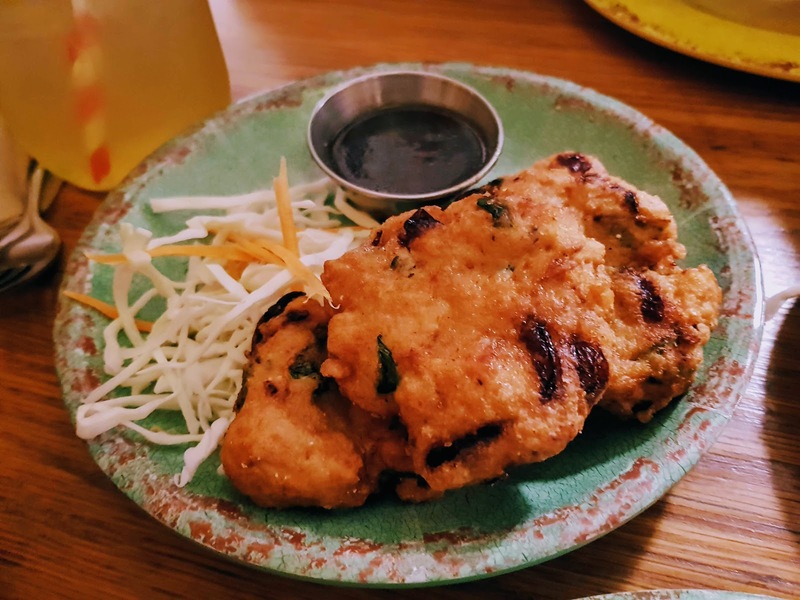 The Deep-Fried Larb Patties were...terrible. If there is one starter you should NOT order, it's this one. These patties were extremely dry chicken patties and really lacked flavour. I ended up leaving them. While the starters were a bit hit and miss, things started to really look up when it came to the mains. Out of all the mains I tried, the Fried Rice with Chicken was probably my favourite. 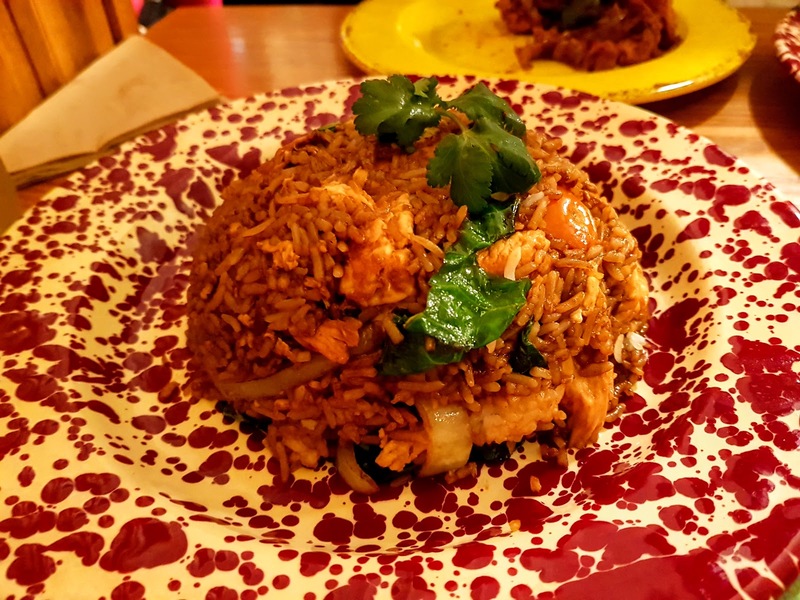 Usually, fried rice is nothing special, it's even simply left as a side dish but Rosa's Thai's Fried Rice was a pleasant surprise! It's incredibly moist, packed with flavour and you can choose to have chicken, beef or prawn mixed into it. It is a big heavy dish but I didn't mind that. It's filling, warming, and exactly what you want in winter even if it does mean you want to fall asleep straight after. 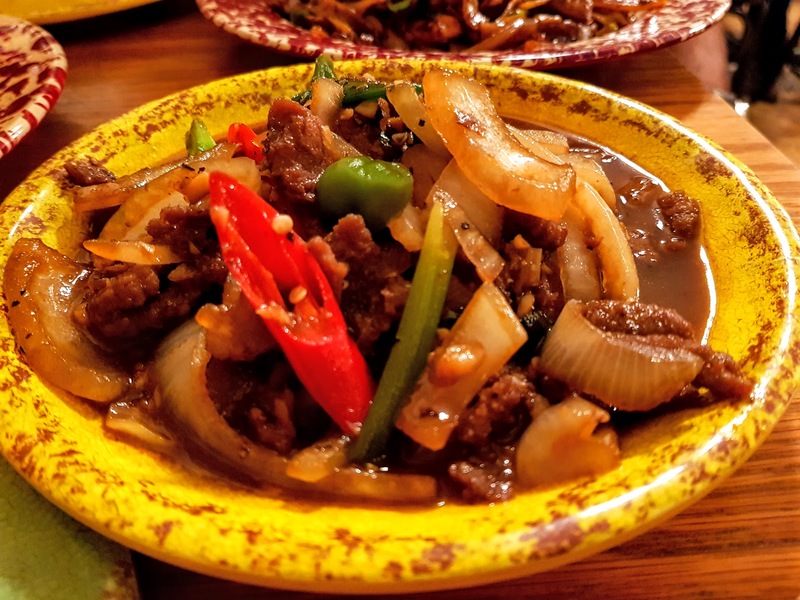 The Stir-Fried Beef in Black Pepper Sauce was almost another hit. It was packed with flavour, peppers and onions. The only downside was the beef was tough and a little overcooked in my opinion. The Drunk Noodles, on the other hand, is a safe bet. It's a big hearty meal so if you are feeling hungry this a good option. 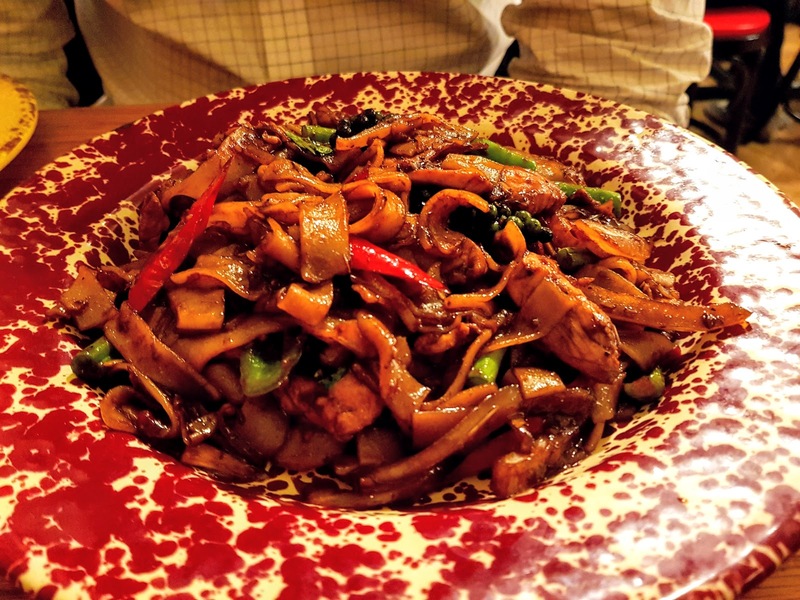 This dish doesn't actually contain any alcohol, it gets its name from being a huge tummy filler. Again you can choose if you want to have it with beef, prawn or chicken and, as its name suggests, it's a big heavy meal. But hey, you might want exactly that. It's tasty and full of thick pasta noodles. 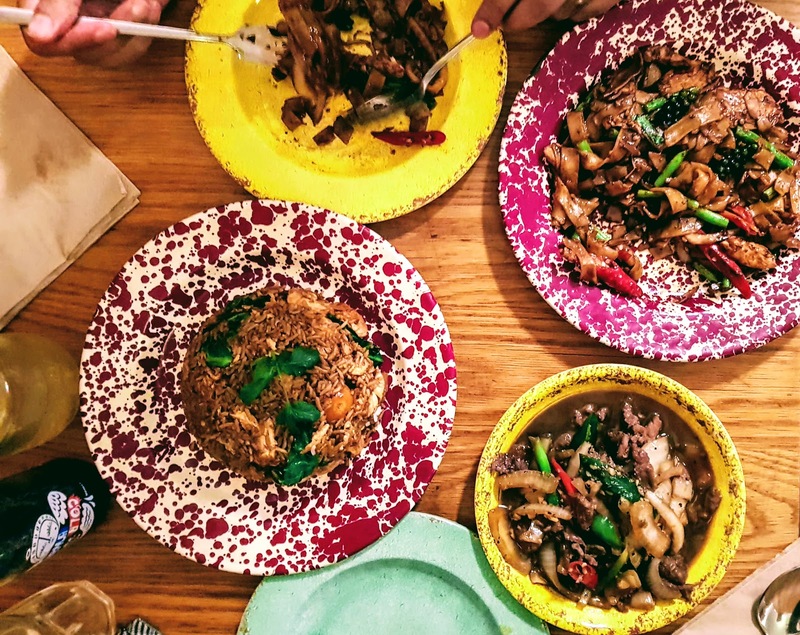 All in all, Rosa's Thai is a good spot for a casual catch up if you are looking for an affordable meal and you order right! Some of the dishes are really good while others are not worth ordering at all so it's a bit of a mixed bag. However, if you nail it - it's a great little spot.